“We definitely have our smallest team ever and I predict that a break will win this year, particularly after everyone saw Jack Bobridge last year." Reigning champion Caleb Ewan will line up with confidence from yesterday’s final stage victory at the Mitchelton Bay Cycling Classic and the knowledge of last year’s success. The 22-year-old will not have as many teammates as 2016, but will be joined by ever-reliable lead out man Mitch Docker and workhorse Damien Howson. With four of the six representatives coming off the Mitchelton Bay Cycling Classic, including stage winners Amanda Spratt and Jessica Allen, ORICA-SCOTT go into the criterium with confidence and winning form. Two-time Australian road race champion Gracie Elvin will join the team for the first time in 2017, adding another level of experience, whilst the team will also welcome debutant Georgia Baker. 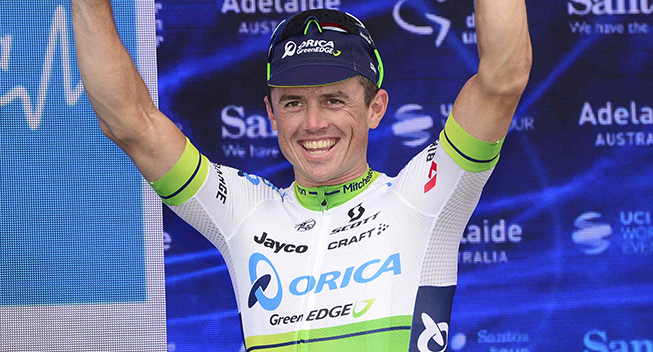 Two previous winners in Luke Durbridge and Michael Hepburn will represent ORICA-SCOTT in the time trial on Thursday. The pair both come off the Mitchelton Bay Cycling Classic, where Hepburn claimed a victory on day two in Portarlington. A lot comes down to feelings on the day, but they will have some stiff competition in reigning champion Rohan Dennis. Reigning champion and world championship bronze medallist Katrin Garfoot returns to defend her title and will be the clear favourite to beat on Thursday. ORICA-SCOTT will start the men’s road race with their smallest contingent in history due to family priorities, injuries/illnesses and varying season programs. But there’s no shortage of experience with two previous winners in Simon Gerrans (2012 and 2014) and Luke Durbridge (2013) amongst the group. ORICA-SCOTT will start with eight representatives in the women's road race including previous winners Gracie Elvin and Amanda Spratt. With cards to play, the outift will be looking to take the green and gold jersey to Europe in 2017.